If you know a gamer that needs to dress up then this pair of cufflinks would be just perfect. The cufflinks look a lot like the Playstation controller and are hand painted. Now even going to a boring dress up occasion will be fun because you keep your shirt sleeves closed thanks to these cufflinks. 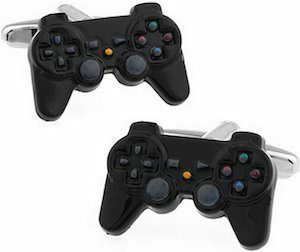 And these video game controller cufflinks are also great as a present as they come in a great looking gift box so that you can surprise your gaming loved one with these cool cufflinks. Come and take a closer look at these Video Game Controller Cufflinks. This black cap is made from gamers that like the classics. The black hat has on the front a picture of the famous NES game controller as Nintendo made them in those days. Just by wearing this baseball cap you can feel the memories come back from the times that video games where still in the infant stage. This Nintendo hat is made for ages 14 and up and is a one size fits most item. 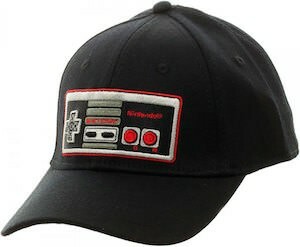 Come and get a hat on and let it be this Nintendo NES Game Controller Baseball Cap. Male and female games are gone love this t-shirt. This t-shirt shows a heart bead like you see on those machines in the hospital but on the end of the chart there you find a game controller. So if video games make your heart beat then you maybe want to take a closer look at this t-shirt. You can get this video controller t-shirt in a men and women’s cut in many fun colors and in sizes going from Small – 6XL. 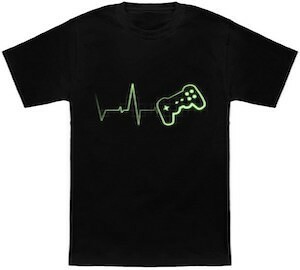 So now you can show the world that your game console keeps you alive by simply wearing this fun Gamer Heartbeat t-shirt. 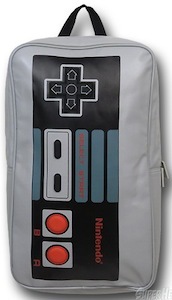 Are you gamer that started out on a classic Nintendo game console? If so then this t-shirt is perfect for you. On the t-shirt you can see a old Nintendo controller in the middle on top of a circle that has the words “Classically Trained” written in it and around it some stars. The grey t-shirt is just perfect for any video game loving person and if you like you classics then this t-shirt is perfect for you. And this Nintendo t-shirt is available in adult sizes Small – 2XL so that many of us can enjoy one. 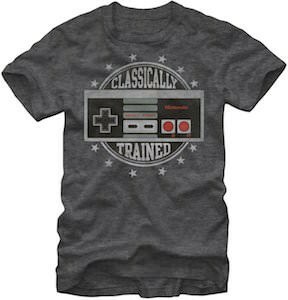 So time to add a shirt to you collection and I would say let it be this Nintendo Classically Trained T-Shirt. And with that of course I mean that you control a lot of video game controllers. 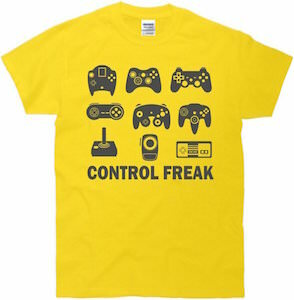 This t-shirt that comes in yellow, black, grey, blue and white shows 9 game controllers from the classic Atari one to an Xbox one, and below all those controllers it simply says “Control Freak”. And we all know it’s always smart to have a spare controller lying around just incase. You can get this 100% cotton gaming t-shirt in a wide range of sizes from Small all the way to 5XL so that many gamers can enjoy a nice shirt that understands them. Get ready to control by wearing this Control Freak T-Shirt. This Christmas your tree can look more like you entertainment area full of video game controllers. This set has 4 classic controllers but they are Christmas tree ornaments and that makes you tree part of you video gaming fun. 4 controllers from all the classic systems can be part of your Christmas and every Christmas to come. 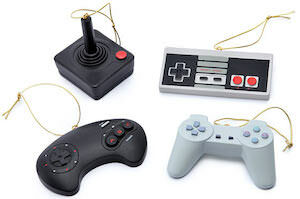 No more boring balls just hang these controllers in your tree and you are good to go. Come and get your own set of Video Game Controller Christmas Ornaments. So you like video games and you really like video game hardware. 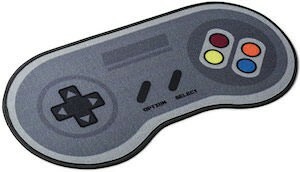 Now you can have a wall decal that looks like the classic Nintendo NES controller and this decal is 33 x 22 inch so it can fill a fair bit of space on your wall. Your office, bedroom or gaming room all can look fun with a wall decal like this. 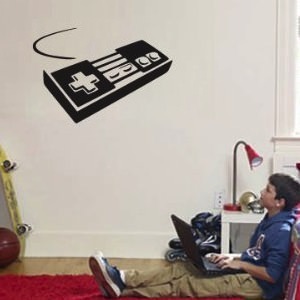 So if you like this NES controller then come and check out this Nintendo Classic NES Controller Wall Decal. Are you and old school gamer who used the old style Nintendo controllers and played all the old games like maybe even pong? If so then this is the poster to make you entertainment room look special. Of course if you never even heard of pong then still this could be a great nerdy piece of decorating for you room. 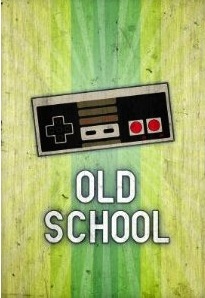 Come and see this Old School Gaming Poster.